( ) 1. What’s the matter? ( ) 2. What are they doing? ( ) 3. Mum, did you wash my shirt? ( ) 4. Who is sleeping? b. I hurt my arm. c. They are walking happily on the ground. d. Li Ming is sleeping quietly. But look at Danny. This is ____(难). He ___ (弄伤)himself(他自己). He needs some ___(帮助). Ⅲ. 1. Danny hurt his arm. 2. 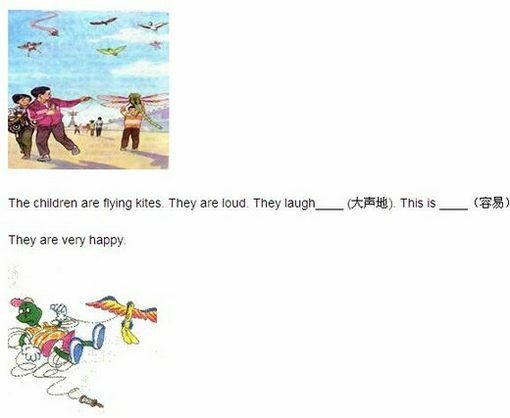 The children laugh loudly. 3. Can Danny fly a kite?